Just as was promised back in February, the Amazon Kindle Beta app was released yesterday on the official hard-launch day of the HP TouchPad, and from the looks of it, many of you have already installed the updated app to start reading your favorite books on the 9.7 inch screen of the tablet device. Next to document editing, a movie store, music streaming and video calls, having the Kindle eBook reader was an essential feature for many of you that were looking to be early adopters of the flagship webOS device. With it finally arriving to every TouchPad owner in the US, HP has found another piece of the puzzle that will attract many users to the TouchPad from the competition, and we have the full review of the app right here. We've put the app through a number of tests and even taken a look at a few different eBooks to give you a full look at the app in its current form. Which, as the title of the app says, is still in the Beta stage; a good thing in our books, because while the app is very good it could still stand for a couple of improvements. Hop after the break to read the full review and see the screenshots, and then head to the app catalog to download the app for free on your HP TouchPad. 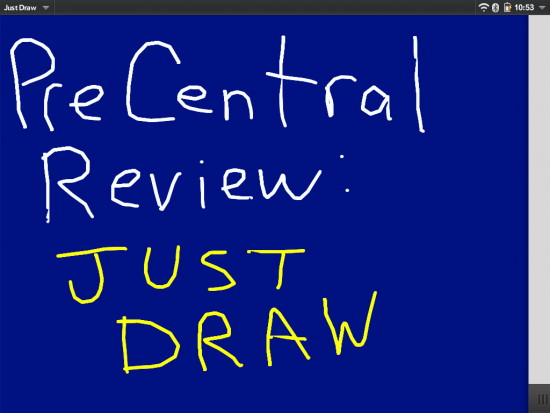 Just Draw, by Volatile Nuances, is an aptly named app for the Touchpad that will allow you to just draw on the Touchpad. 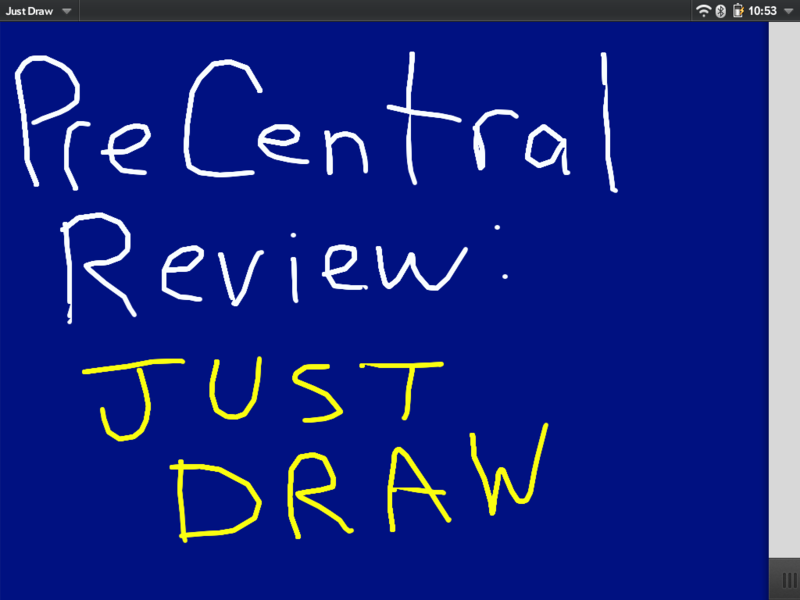 For the low price of free, you can drag your finger across the screen and draw till your heart is content. The app itself is pretty simple. Upon loading up the app you are presented with a simple white screen, with a closed sliding pane along the right. Slide open the panel and you will be presented with a menu of options. Along the top are three buttons that will allow you to undo up to ten of your previous actions, the ability to clear the screen, and the option to save your picture to the Photos app. 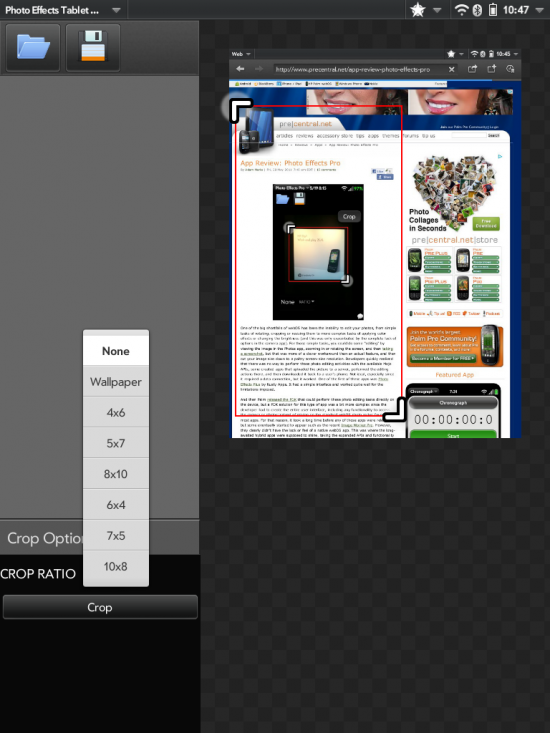 Underneath those buttons is an option to change the brush or background color, followed by a brush size selector, and finally a color wheel that allows you to select any color for the brush/background. Once selected, the color appears as a bar just to the right of the wheel. Setting up the app was pretty easy. You open up the app, it prompts you for your Google email and password, and you are in. As with most Touchpad apps, gReader HD sticks with the sliding pane setup, where your feeds show up on the left side of the screen, with the full article listed on the right that can be slide to take up the full screen if desired. Actually, the left-pane does triple duty, switching between your feed view, an article list view, and favorites. I would have preferred a three-pane view like email that had feeds, article list, and actual article, similar to how the email client works, but still works fine as is. If you have little children (or are just a child at heart), you probably have hours of Sesame Street episodes DVRed, a Tickle Me Elmo doll and a ton of Sesame Street books that you read to your little ones. 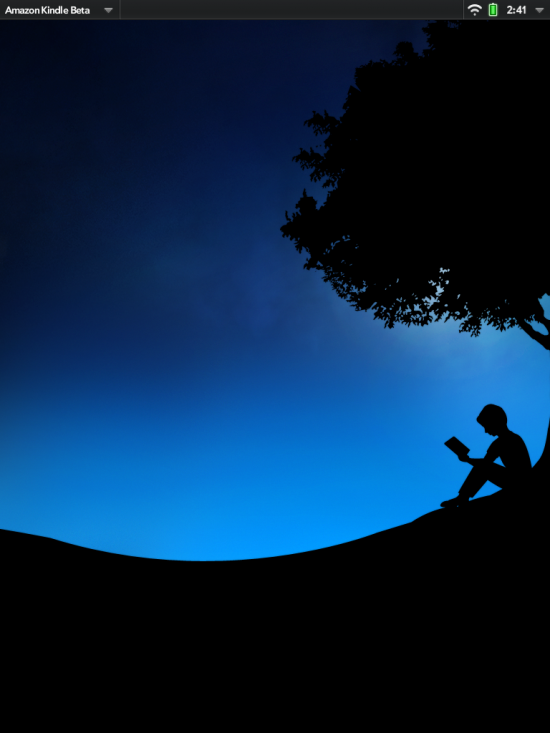 If you have a Touchpad, you can now add interactive books to that list. ScrollMotion Kids has released a line of books into the App Catalog for $1.99 each, with a handful of Sesame Street titles, as well as a Curious George and Arthur book for your reading pleasure. 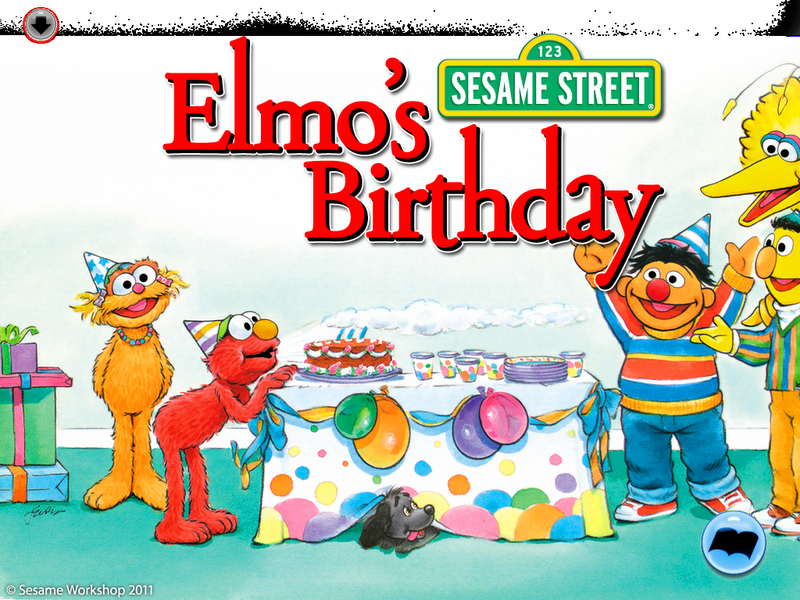 When you first load up the app (Elmo's Birthday, in this example), you are brought to the cover page of the book. A small down arrow on the top-left corner brings down a menu to jump back to the Cover page (where you currently are), start the book from the beginning, or go to the help screen. There is also a button on the bottom-right that will also start the book. Just as the recent Photo Effect Pro for webOS 2.1, this is actually a hybrid app, although an Enyo/PDK hybrid and not a Mojo/PDK hybrid. However, the general look and feel of the app remains relatively consistent with its mojo predecessor, just taking advantage of the much larger screen of a tablet while still performing all photo editing directly on the device. No internet connection needed. In the midst of the wave of brand-new TouchPad-specific apps that were present at launch were several old standbys rewritten to take full advantage of the additional screen real-estate and sliding-panel UI of HP's first webOS 3.0 device. 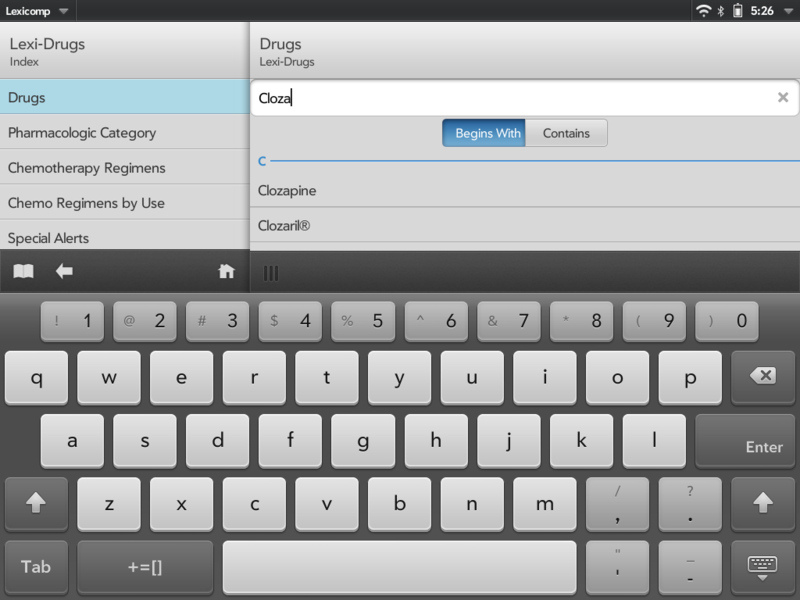 Fortunately for anyone in the medical field, one of the apps that clearly puts this extra space to good use is Lexicomp. Click through the break to read our full review on this medical app for the TouchPad. For those not familiar with Paratroopers, the premise is quite simple. 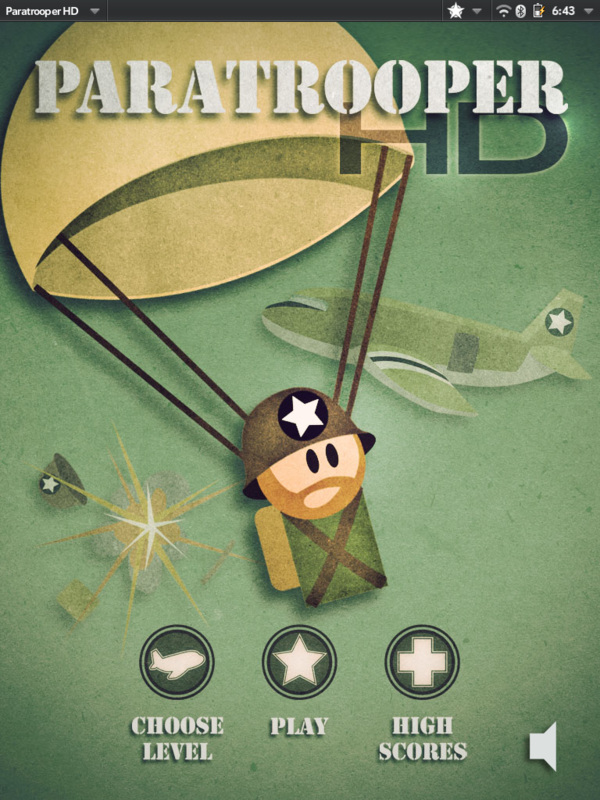 You are in control of a limited number of Paratroopers who will jump from airplane in an attempt to land on a target zone on the bottom of the screen, tilting the device to control the direction that they fall. Each level has a set challenge that you must overcome to advance to the next, from landing a certain number of jumpers, getting a certain score, or just surviving. As you progress through the levels, you gain more control of the jumpers (e.g. when to pull the rip-cord) while the challenges get more difficult and more hazards appear. Gaming on the TouchPad has been a major talking point for HP since ThinkBeyond back in February. Certainly we here at PreCentral have had our fill of Armageddon Squadron videos from YouTube. Now with the TouchPad finally available, it’s good to see that there’s a healthy representation of games already on tap. Among them, Galcon Fusion is definitely one of the standouts. People familiar to webOS handsets may recall hearing about Galcon around this time last year, when developer Phil Hassey, with zero webOS experience, ported the app from iOS to webOS in less than three days and blogged to tell the tale. It should come as no surprise then that Galcon Fusion; the tablet optimized version of the app with improved graphics and sound, already exists for the iPad. 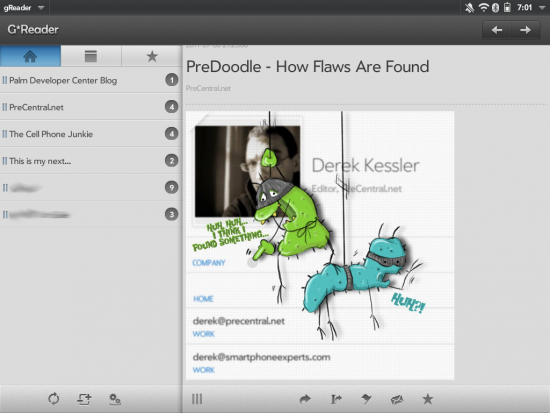 The webOS version is a full featured, (and highly entertaining) port of that. For those unfamiliar, Galcon and Galcon Fusion are fast-paced realtime strategy games where players compete against one another for full control of all planets on a given map by occupying them with spaceships. Once a planet is occupied, the planet becomes a production site for more ships, with larger planets producing ships faster than smaller ones. 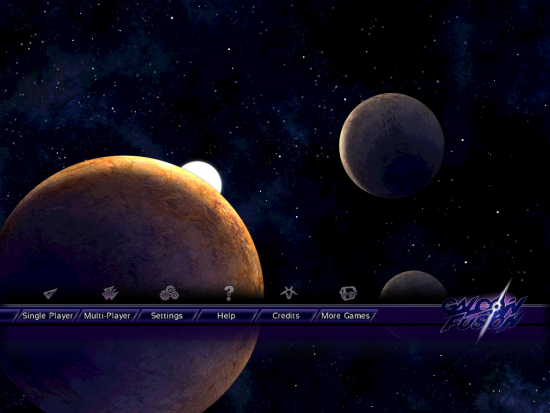 A player loses control of a planet if attacked by a larger squadron of ships than they have present there. It’s similar to the board game ‘Risk,’ but much faster: games typically are won or lost in under a minute. Even the most drawn-out battles seldom take more than a few minutes to play. The premise is simple, but gameplay is fantastic. It has just the right mix of strategy and action to keep you coming back time and again, and the pace is fast enough to easily play a few rounds during those off-minutes while riding on a bus or waiting for a meeting to start. Galcon Fusion has ten different levels of difficulty, eight gameplay modes, and a thoroughly enjoyable online multiplayer mode with scorekeeping, chat, and a host of other great features. As part of this review, I played for a good half-hour online against a group that consisted of myself on a TouchPad, a person on an iPad, and a few people playing on desktops. I got schooled by the other players virtually 100% of the time, but they could see by my ranking that I was a total noob, and offered up lots of pointers between rounds to help me get competitive. Great stuff. In these early days of the TouchPad, it’s terrific to see a ton of fantastic apps already available. If mobile-minute strategy games are a big-ticket item for you, Galcon Fusion is definitely a must-have. It’s available now in the App Catalog for $2.99. HP has made it clear in its positioning of the TouchPad that the device (and, indeed, the entire webOS ecosystem) is being targeted squarely at the enterprise market. 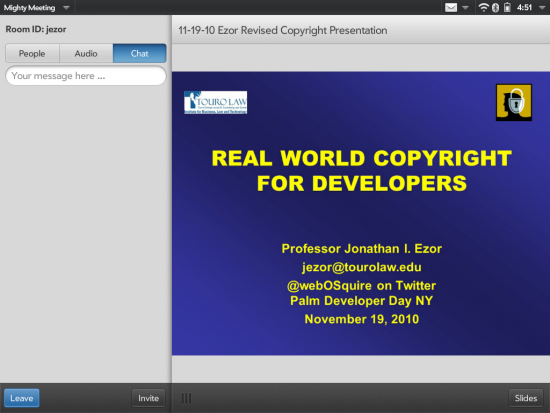 One launch day app that is clearly designed to leverage that targeting is Mighty Meeting, which enables TouchPad users to organize and manage Web-based presentations, utilizing Mighty Meeting's own dedicated servers (rather than a screen sharing setup) to host and coordinate both the audio, video and (PowerPoint or PDF) slide portions. The app is simple and works extremely well. Keep reading more after the break. With today's launch of the HP TouchPad comes a new EA game: Need for Speed Hot Pursuit for TouchPad ($9.99 in the App Catalog). It follows in its predecessors' tire tracks (and the iPad version of the game) by giving the player control of a fast car; in this case, either as a racer or as the police officer tasked with stopping racers. Cars, tracks and other awards are unlocked as players earn achievements, and the vehicles (up to 20, including 15 police versions) include the Pagani Zonda Cinque and "high-speed police interceptors like the Lamborghini Reventon." In addition to ramming and roadblocks, the police cars may be outfitted with weapons including spike strips and an electromagnetic pulse (EMP) lock to disable the fleeing felon's engine. 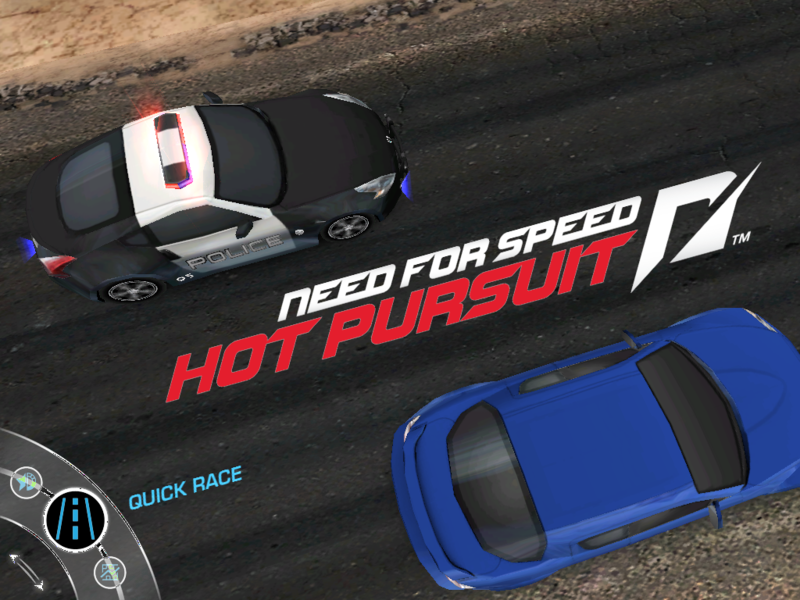 If you're a driving game afficionado, NFS: Hot Pursuit seems like it will be a good addition to your new TouchPad. Happy speeding!